Since successfully updating the blueprint for the fall 2015 Internal Medicine Maintenance of Certification (MOC) exam and releasing five subspecialty blueprints for review at the beginning of 2016, the American Board of Internal Medicine (ABIM) has opened the blueprint review process for seven more subspecialties. A blueprint is the content outline used to create assessments. During the public blueprint review process, ABIM Board Certified physicians rate the relative frequency and importance of individual medical knowledge topics. ABIM then uses their feedback to assure that MOC assessments reflect what’s important for physicians in practice to know, today. Thousands of physicians have already participated in these reviews and their input is being used to update ABIM’s MOC assessments, which are currently in the form of a 10-year exam. As announced in May, by January 2018, ABIM plans to offer an alternate assessment option. The blueprint review occurring now will help to guide the content of the proposed shorter, more frequent assessments as well as the 10-year assessment option, which will remain in place should physicians prefer it. As this work continues, we have confidence in ABIM’s current 10-year assessment as it produces reliable, valid results to determine who meets a peer-defined performance standard. To remain certified, physicians with certificates that expire in 2016 and 2017 will need to take and pass the 10-yr exam, most of which will be updated through the blueprint review process. ABIM wants to hear from you and your physician colleagues: Your input provides crucial insights about the content of MOC assessments now and in the future. 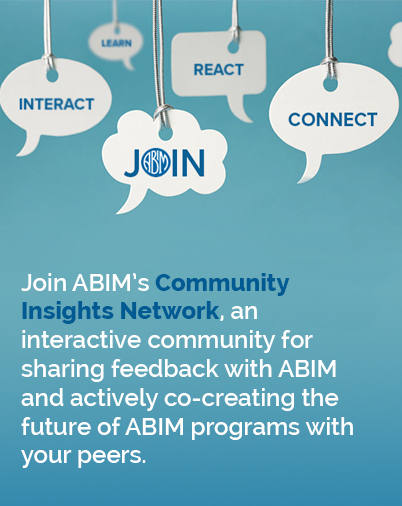 We welcome your feedback and encourage you to subscribe to the Transforming ABIM blog to learn more about how your input is helping create a better MOC program. Access: Sign in to abim.org and on your home page you will find links to each blueprint review for subspecialties in which you hold valid certifications. Time Commitment: The estimated time needed to rate each blueprint section varies and could range from approximately 15 to 20 minutes.